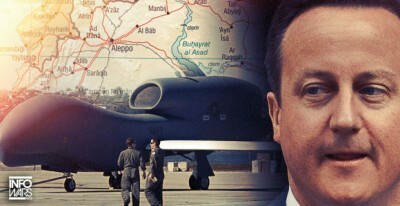 During a National Security Council meeting on Tuesday the British military presented David Cameron with a plan to establish a no-fly zone in Syria, according to Sun Nation. On Monday Defense Secretary Michael Fallon called a private meeting of backbench MPs and informed them he was “open to the idea” of a no-fly zone. “We will need to have a full plan,” Fallon told the politicians. The plan, which is touted as a way to stop the massive refugee crisis now plaguing Europe, was one of several drawn up by Britain’s military and intelligence officials at the behest Cameron. “The PM has made it clear that he wants to do more in Syria as the root cause of the ISIS threat as well as the refugee crisis. A no fly zone is back on the table as one option,” a senior Whitehall source told Sun Nation. In addition to a no-fly zone, the British government is looking at stepped-up Royal Air Force airstrikes and drone attacks targeting ISIS positions in Raqqa. A previous effort in 2013 to impose a no-fly zone over Syria was taken off the drawing board after the government lost a Commons vote on missile strikes. Any effort to impose a no-fly zone will increase the probability of a confrontation with Russia. The Russians are using the main international airport in Damascus to airlift tons of supplies, soldiers, and armaments including several of its most advanced battle tanks to defend the Syrian government. In addition, the Russians are establishing a base in Latakia near the ancestral home of Bashar al-Assad. U.S. military officials insist the Latakia base will be used to stage airstrikes against proxy fighters attempting to overthrow the government of al-Assad. In order to avoid confrontation with the Russians, the British may use naval ships at sea armed with cruise missiles to enforce the no-fly zone.